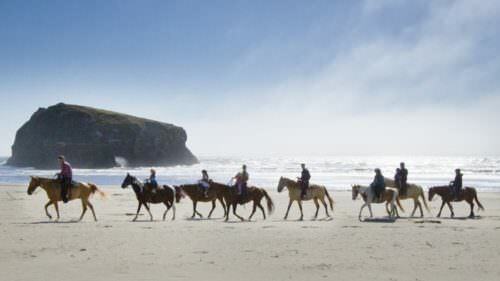 Make Bandon your basecamp for adventures on Oregon’s South Coast, a rugged and serene stretch of shoreline dotted with remote beaches, lesser-known trails, wild rivers to paddle and ocean-fresh fare to fuel your adrenaline. 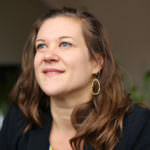 Ready for a time-out from your frenetic pace? You’re ready for Bandon. For families looking to reconnect with one another the old-fashioned way — you know, face to face — there’s no better place to put the technology away. Just over four hours south of Portland on Oregon’s windswept South Coast, Bandon boasts miles of sandy beaches, a vibrant arts scene, some of Oregon’s finest sea stacks and the incomparable feeling of being far away from anything that could be described as “bustling,” “crowded,” or “hectic.” So pack up the kids, grab the dog’s leash, stock the car with snacks and head out for a little memory-making on Oregon’s South Coast. From windswept beaches and rugged forest trails to stroller-friendly city parks, Bandon has a walking opportunity for every age and ability. Need to burn off some steam? Head out to China Creek Beach, part of Bandon State Natural Area, fora one-mile jaunt to wide, sweeping sandy beaches. 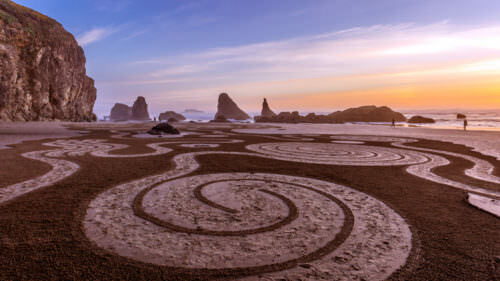 A couple miles north at Face Rock State Scenic Viewpoint, local artists create elaborate labyrinths in the Circles in the Sand at low tide for visitors to admire and explore. Check the event calendar for times and locations. Teach little ones to catch their first fish at trout-stocked Bradley Lake, which has a boat launch, walking trails, beach access and picnic areas. Families can also hit the jungle gym at Bandon City Park — home to a nine-hole disc golf course, dog park and baseball diamonds. If you’re not tired yet, take your own nature excursion at Coquille Point. Benches up top make a comfy perch for scanning the horizon for migrating gray whales and watching seals on the rocks below. Then, take the 100-plus stairs down to the beach for tidepooling and beachcombing. Surrounded by wilderness, Bandon offers myriad opportunities for birdwatching, otter observing and whale spotting.Twenty-five miles north of Bandon, just west of Coos Bay, Shore Acres State Park combines lush formal landscaping with a secluded ocean cove where visitors can view Simpson Reef, a stretch of sandstone formations anchored by Simpson Island. Watch California sea lions and ocean birds jockey for a perch or, if it’s foggy, just listen for them. Back in Bandon, bring your binoculars to spot thousands of shorebirds en route to or from the Arctic shelter in the spring and fall at Bandon Marsh National Wildlife Refuge. Paved trails and interpretive displays offer helpful information about the wildlife you’re seeing, and volunteers give talks in the summer. At Face Rock State Scenic Viewpoint, ask kids to spot the face on the famous sea stack (hint: It’s in profile). 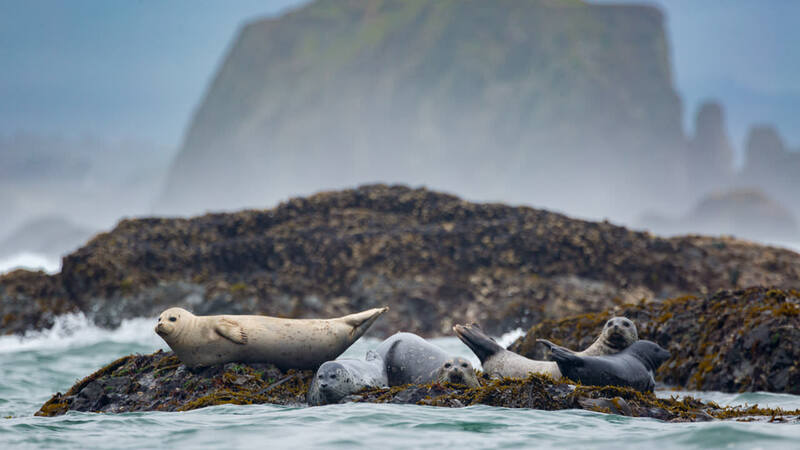 Also based in Bandon is Shoreline Education for Awareness, a nonprofit that offers ranger-led talks about seals, birds and whales in the region’s natural areas, as well as seminars during the winter months. Whenever you’re visiting Oregon’s sensitive coastal areas, remember to Leave No Trace: Put rocks back where you found them, take your trash with you, and observe critters and sea birds from a safe distance — for your sake as well as theirs. 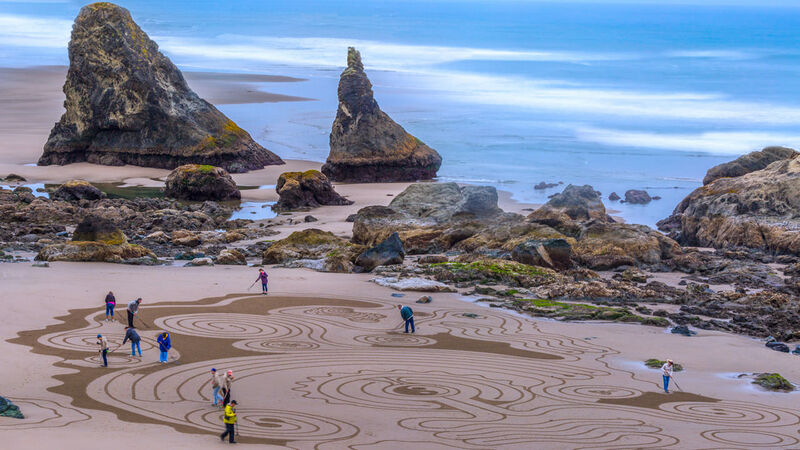 Bandon might be a small town — population 3,000 — but it’s also a thriving community with a fascinating frontier history and vibrant public art scene. Get your bearings at the Bandon Historical Society Museum, where interactive displays tell the story of the town from its original Coquille Tribe residents to its 1996 centennial celebration. Then hit the Old Town Farmers Market (Fridays-Sundays) for local produce, baked goods, coffee and souvenirs. Cap off your stroll by shopping for souvenirs, arts and crafts at one of Bandon’s many specialty merchants. Try WinterRiver Books & Gallery for a new novel, The Cobbler’s Bench for artisan leather goods Bandon Card & Gift Shoppe for everything from toys to jewelry, or Bandon Sweets & Treats for a little taste of vacation to take home with you. 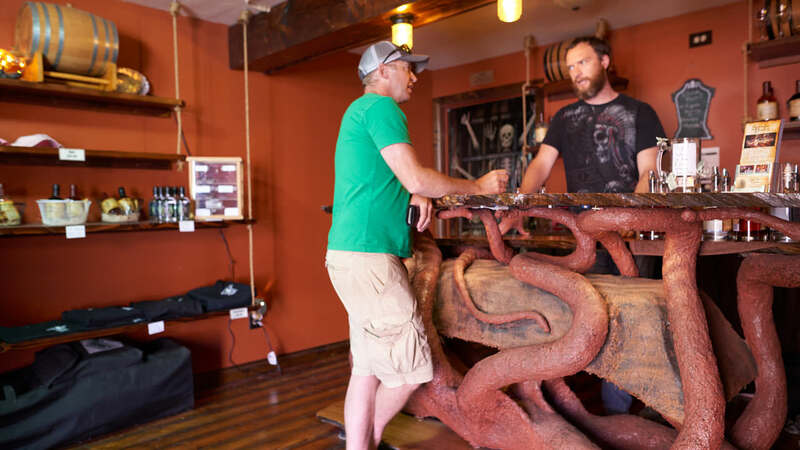 Grab a slice of wood-fired pizza at Bandon Brewing Company and a nip of barrel-aged or fresh fruit-infused rum at Stillwagon Distillery, a couple of blocks away. A walking map makes it easy to find your way. 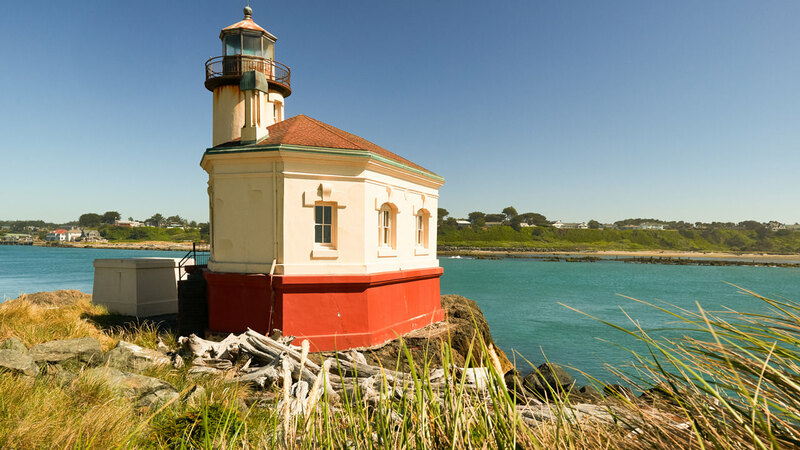 Lined with public art, including sculptures of marine life and Native American carvings, Bandon’s portside walkway, on the northern border of Old Town, is a splendid spot for watching harbor seals gambol and the fishing boats roll in at the end of the day under the watchful eye of the Coquille River Lighthouse. 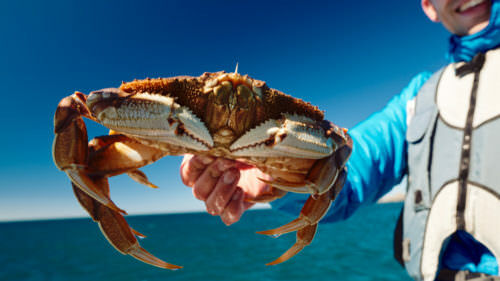 Then, order the famous crab cakes at Edgewaters or ocean-fresh fish tacos at Tony’s Crab Shack or fresh smoked salmon at Bandon Fish Market. And keep an eye out for boardwalk events. Every summer there’s a free, family-friendly lecture series that introduces visitors to the region’s history, wildlife and more. Visit a host of tasty restaurants, breweries, cideries, distilleries, markets, seafood stands and artisan shops in Bandon and elsewhere on the South Coast along the self-guided Wild Rivers Coast Food Trail. Keep an eye out for boardwalk and Old Town Bandon events on the city’s event calendar, including the family-friendly lecture series at Bullards Beach State Park, which introduces visitors to the region’s history. Feeling refreshed, restored, and rejuvenated by a trip to the majestic Pacific Ocean? Pitch in to make sure it stays that way. Stop off at Washed Ashore, an Old Town nonprofit dedicated to raising awareness about marine waste. 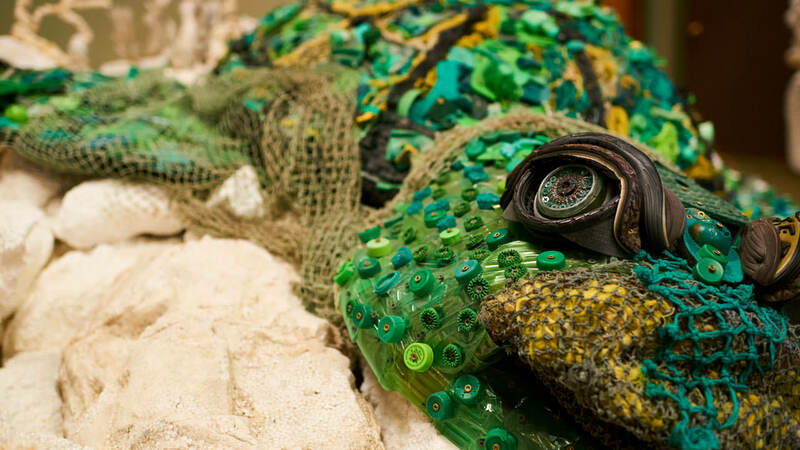 Here, beach trash is sorted and repurposed to create striking works of art that draw attention to the world’s plastics crisis. Volunteers can spend an hour or two sorting pieces, or even help assemble the larger-than-life sculptures of sharks, fish, and other aquatic animals built entirely from plastic litter. Catch Washed Ashore’s giant sculptures on exhibit across the country. At Coquille Point, visitors can say hello to Cosmo, a tufted puffin made of beach plastic found around Bandon’s coastline. Time your visit to coincide with one of Bandon’s many community festivals. On Independence Day (July 4th), the town pulls out all the stops with a morning parade down Highway 101, a community-wide barbecue, cardboard boat races at the Coquille River waterfront and evening fireworks. Or, celebrate one of the region’s most important local crops, the cranberry, during the annual Bandon Cranberry Festival (Sept 13-15, 2019). Each September, vintage cars and farm equipment line the streets while residents and visitors alike enjoy live music, performing arts, contests and numerous cranberry treats. Tons of lodging options in Bandon, from rustic cabins to oceanfront resorts, means everyone can find the perfect place to stay.